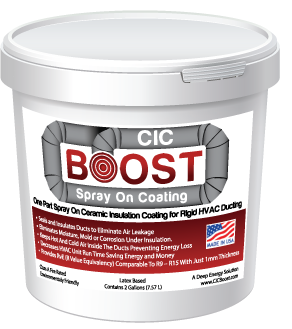 Spray on Ceramic Insulation Coating to insulate and seal rigid HVAC Ducting. 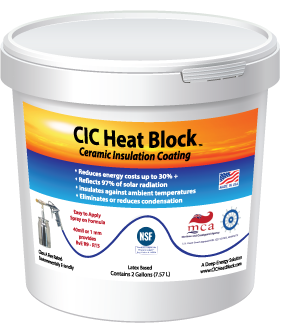 CIC Heat Block is a one-part, spray-on Ceramic Insulation Coating for the Building Envelope. Thermal Insulation from the engine, transmission, exhausts system and solar gain. Reduces Noise from the engine, road and other annoying rattles and irritating vibrations. 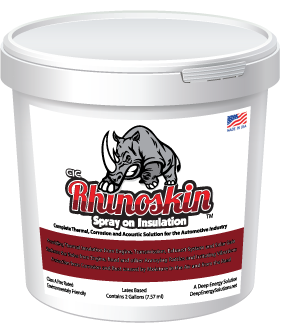 Protection from Corrosion and Rust caused by moisture in the air and from the road. 72 hours is required for the full curing time.